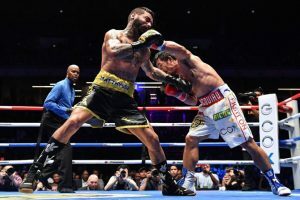 Manny Pacquiao scored his first knockout in nearly a decade when he stopped Lucas Matthysse in 7 rounds in Malaysia for the WBA “regular” title this past Saturday evening. The fight took place at 147lb. The Filipino had took over a year out of the ring since his points loss to Jeff Horn in Australia last year, so there was some concern about ring rust due to inactivity. Add that the boxer is now 39 years of age, and many folk thought that there was serious potential that the Argentinian could end his career once and for all. But that was not to be, as Matthysse never looked like he was ever in the fight. 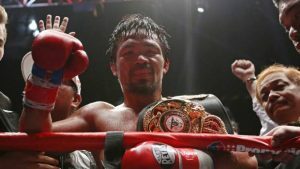 Pacquiao was sharp and never looked in any serious trouble as he put combinations together and floored his opponent three times enroute to the aforementioned knockout to become an 11 time world champion, as well as claim his 60th career win. The final punch of the bout was a left uppercut that put Matthysse down. Kenny Bayless, the referee, initially started counting but when the fighter spat out his mouth piece he aborted it in favour of stopping the fight. 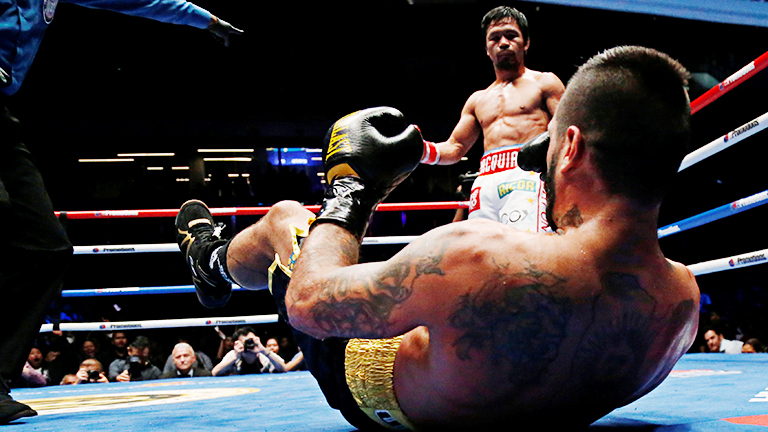 Although Pacquiao looked good on Saturday night, it still seemed as if he has lost a step or two. He still could not swarm Matthysse with unusual punches from all angles like he used to and he was only able to fight in tiny spurts. You also have to question the punch resistance of Lucas at this point. It appears that he went down from a single southpaw jab from one of the knockdowns, which is not a common occurrence. Matthysse had been coming off a 19 month layoff after being beaten knocked out by Viktor Postol in 2015. He came back to grab two wins, one of which was for the WBA crown that he defended against Pacquiao. He fractured his orbital bone in the Postol fight. Informed fans know that can be a career ender. He did not look great against Tewa Kiram, his fight previous to the Pacquiao contest. He was paid a career high of $2.5 million dollars for the Pacquiao battle, and even though some theorise that he “took the money and ran” he deserves to bow out with a decent sum of money. There were also questions as to whether the absence of Freddie Roach, who had been in Pacquiao’s corner for 15 years, would be detrimental for his latest world title challenge. It did not look so, but could it be down the stretch? That is a possibility, you would have to say. But it all depends on who he fights. 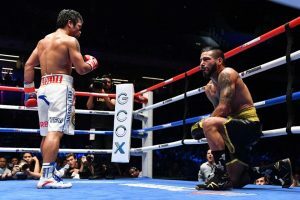 One final factor as to why Pacquiao managed to get a knockout victory was maybe because Lucas Matthysse was more his size. Antonio Margarito, Shane Mosley, Jeff Horn, Brandon Rios and others were all naturally the bigger men. Might it be wise for Pacquiao to focus on the 140lb division for the foreseeable future? Names like Amir Khan have been mentioned for the former “Mexican Destroyer’s” next contest. But that is unlikely to be as Eddie Hearn will probably want to make that Khan v Brook fight, which would be a huge British showdown. Then again, Matchroom have missed opportunities before when they bizarrely threw now retired Dagenham fighter Kevin Mitchell in the ring with the then unbeaten southpaw Ismael Barroso to end any hopes of a rematch after losing while ahead to Jorge Linares. A return would have surely packed out the 02 in London again. So, who knows! 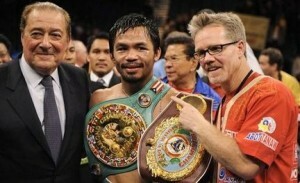 Despite the fact that Manny Pacquiao looked good a couple of days ago, let’s not get too ahead of ourselves. He still needs to be carefully matched at this stage in his career while still trying to fight for the most money possible. And that could be more complicated than it looks!